Heuchera Canyon Duet is spectacular in bloom with stalks of white flowers coming out of pink buds. The flower stalks are 6-8 inch tall. The 1 inch round leaves are all at the base. Heuchera Canyon Duet slowly spreads to form a clump a foot or so in diameter. Heuchera Canyon Duet is a Santa Barbara Botanic Garden introduction and is the result of a cross between Heuchera Canyon Delight and Heuchera elegans. Heuchera Canyon Duet does best in a shaded garden. While Heuchera Canyon Duet can hunker down through a drought once established, semi-regular water will make for a much better looking plant. Heuchera Canyon Duet is Winter hardy into the low teens. 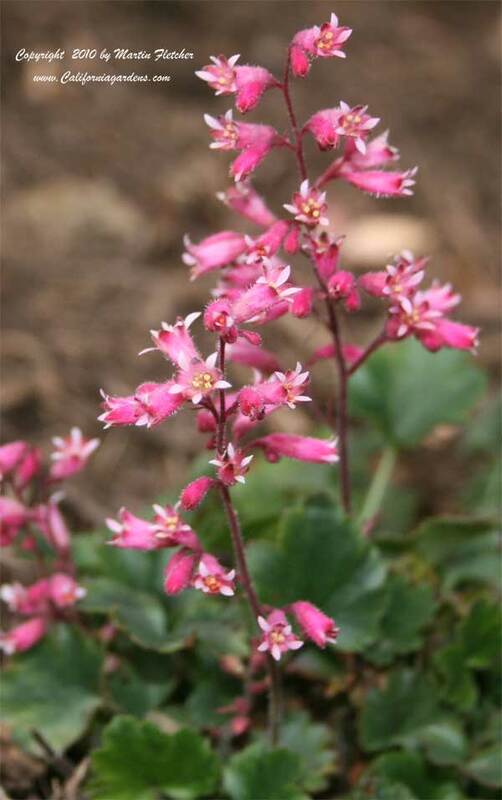 Pink flowers and foliage of Heuchera Canyon Duet - Canyon Duet Coral Bells. High resolution photos are part of our garden image collection.